“Shelter” is a very relative term. When I hear it, I think of emergency evacuation shelters, tents, places to run to when it starts raining… Right now, my shelter is the family station wagon as we drive from South Carolina to New York. For the rest of the summer, my shelter will be the home I grew up in. Come August, I’ll drive myself back to my newest “shelter” at college. I’ve given “shelter” a lot of thought lately. As usual, my mind went a million miles per hour and ran through lots of scenarios. “What IS my permanent shelter? Will I ever have one? What if I never get as used to any shelter as I was to my home? Can I really ever find total stability in another place? What about when I am completely in charge of cleaning the bathroom?!? !” With these questions in mind, I stopped and realized that shelter should not be associated with other aspects of life, like “comfort” and “home”. Shelter simply ensures that you have a space to sleep in. I believe it is what we do with our “shelters” that leads to a sense of stability. I got my first real taste of instability when I started my first semester of college. Almost everything was unfamiliar and new. So, naturally, I did everything I could to make my shelter, my small amount of space- comforting. For me, that meant a Tyler the Creator poster and a massive stack of movies (life tip: I never watched a single one so save yourself the trouble and do not bring 20 DVDs to school) among many objects. The objects you can carry FROM shelter to shelter will bring you more joy than the shelter itself. I became so comfortable in my new shelter at school, I sincerely consider it a second home. There was also a time in my life when I realized that there is a second shelter I can always count on, one that is not going anywhere (like Parks and Rec, sigh)- the outdoors. During the summer following 9th grade, I attended a family wedding in Olympic National Park. The day of the wedding, my cousin (the groom) and his Coast Guard friends decided to go for a hike and invited me to tag along. This ended up being one of the best decisions I have ever made. Up until this point, I had never hiked and would have preferred going to the mall over being outside. The hike ended up being 7 miles roundtrip and we were practically in the clouds when we reached the top. The view was incredible and opened my eyes to a greater part of life. Since then, I have stopped to appreciate the scenery around me. I have found a 40 minute drive along tree lined and reservoir filled roads that makes me feel completely at ease. There is a sprawling field not too far from me with odd sculptures and a couple of horses that is incredibly serene. Too often we take for granted the gems that are in our backyard. Your shelter is going to change many times in your life. I know I will eventually leave the realm of higher education, and will have my own apartment. I know over time I will probably move somewhere else and obtain a new living space. But, I also know I can make the shelters of the future (that would be a good band name) just like my old ones. We lean towards the familiar and find comfort in what we are used to. Don’t let the thought of a new and unknown shelter scare you. “Shelter” is just a term. It’s just a broad spectrum, not nearly specific enough to cover (pun intended) you and all your individual spaces you will live in and make feel like home. Find the good and positive in your new environments. I know that whatever shelter I end up in, I’ll always have my second one beyond my front door. 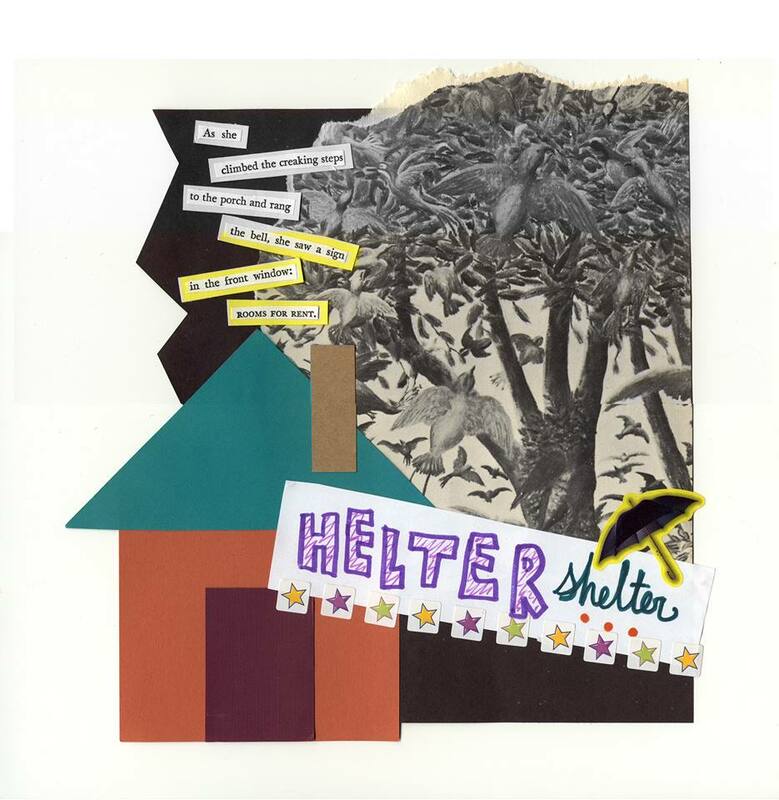 It is almost fitting that the antonyms for “shelter” are bright and light. Nice job Virginia! Love it!